Breaking Putts: What Changes Should You Make in Your Putting Setup? straight uphill or downhill putts. Adjusting your ball position and the angle of your putter shaft for a putt that breaks is probably not a good idea. This is because it adds variation. The question is whether you should treat each of these putts slightly differently depending on how you anticipate the ball to break towards the hole? In the longer version of the game with your fairway shots there are a number of adjustments to your setup when you are on a slope with the ball above or below your feet. Why not make similar adjustments when you putt? To put the two situations in context, the slopes on the fairway are typically much greater than those on the green. On the green it is recommended that the slope should not exceed three degrees in the proximity of the hole. Any more on a medium-fast surface and the ball will keep rolling. So for a four- to five-foot putt we are talking about a very small change in elevation between the ball and your feet. It is a common belief among golfers that right-to-left putts are easier for the right-handed golfer than putts that break the other way. This is because the arc of the swing travels right to left around your body and is more consistent with a natural stroke. When the ball breaks away from, rather than towards your feet, there is an uncomfortable feeling that you somehow have to steer the putt. One suggestion for breaking putts deals with your ball and shaft position. On a left-to-right putt you should advance the ball in your stance and move your hands back. At the point of contact your putterface will be closing so the ball will start slightly left of your aimline (target line). On the other hand for a right-to-left putt you should position the ball further back in your stance and move your hands forward. 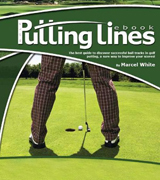 This will encourage you to stroke your putt with an open face so the ball starts slightly right of your aimline. To my thinking this idea seems more of a band-aid solution than good form. As all putts begin straight, I feel that you should always try to square the putterface at impact. It is important that your ball starts off on the aimline you have chosen, and tinkering with impact positions makes this more of a lottery. One fundamental of a sound putting setup is that your putter is properly soled on the ground. You don't want either the toe or the heel off the ground. On a sloping surface the relationship between the sole of the putter and the surface changes. Although most putters have a radius on their sole to accommodate any marginal changes in lie angle, you need to be aware of how your putter is resting on the putting surface. Unlike straight uphill or downhill putts your feet on breaking putts will be more level. In general the only adjustment you may need to make is in your posture. Your posture should conform to the slope of the green. With the ball below your feet you may have to lean forward slightly. With the ball above your feet you may have to stand taller. In the end breaking putts are more to do with picking an aimpoint (target) or path that matches the arrival speed of the ball at the hole. Getting the right read and matching speed is where the skill lies.